Safety and security on campus environments has become a significant concern for education officials. Today’s campus administrators are under constant pressure to secure their facilities, and to provide a safe educational environment – and to do so in the midst of mounting budgetary constraints. A broad range of solutions are available to administrators searching for ways to meaningfully elevate their campus safety and security programs. One solution administrators should consider is implementing a key control system. 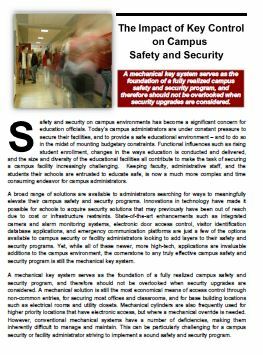 A mechanical key system serves as the foundation of a fully realized campus safety and security program, and therefore should not be overlooked when security upgrades are considered. By combining 4 essential key control cornerstones into an integrated program, the InstaKey® Key Control Program is uniquely suited to help Campus Facility Clients realize increased keyed access security, decreased liability, greater efficiency and convenience, and meaningful cost savings.